Earlier this week I decided that I would work in the yard today. I had to make the decision in my head and remind myself over and over again that was the plan so that I wouldn't procrastinate the work. Then I heard the weather forecast for today.......high of 50 (at 5 pm) with 25-40 mph NW winds. Brrrrr. BUT, I would much rather work outside in the cold than in the hot, so after breakfast (sausage and egg bake made last night and baked this morning), I got ready to head out. First order of business.....figure out what clothes to wear to stay warm! I intended to wear a pair of cotton leggings under my work pants ..... but apparently at some time in the past I got rid of them. Boo. So, I pulled out some shorts and knee socks to layer under the pants. Then a tshirt, long sleeve tshirt and sweatshirt. Finally, a headband I bought to go skiing in college to keep my ears warm. As I was getting ready to go out, I heard a knock on my front door. I almost ignored it because last night about 8:30 my doorbell rang and rang.....and of course, when I got there, nothing. Some neighborhood kids must have been roaming around ringing doorbells and then running off. But I did answer the door this morning and it was my next door neighbor asking to borrow an egg. I've never actually had that happen before! This neighbor is the one that occasionally trims my front hedges for me and, when I met him shortly after I moved in, offered for me to borrow tools any time I needed something. I started carrying armloads of posts to the front and had a thought.....this sure would be easier if I had a wheelbarrow. Hmmmm. Wonder if my neighbor has one I could borrow? In the past, I probably would have had that thought and let my pride rule the day and not go ask (because if you know me at all, you know that asking for any type of help is rather challenging for me). BUT, because he had already come to me today asking for something, I forced myself to go next door and ask if he had a wheelbarrow I could borrow. And guess what? He did! I definitely learned a lesson today about being neighborly.....and how it tends to cause others to do the same. I hope that I will hesitate less next time before humbling myself to ask for help! 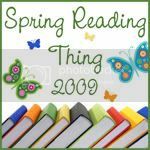 So, it is time again for the Spring Reading Thing over at Katrina's blog....unfortunately, I don't have much of a list. All I have right now is to read The Shack by William Young. Update: Just remembered that I have a book on loan from a co-worker. The Secret Lift of Bees by Sue Monk Kidd Also had a recommendation from one of my elders wives while we were chatting at a wedding last night.....The Big Rich: The Rise and Fall of the Greatest Texas Oil Fortunes by Bryan Burrough. I was able to spend the weekend with my family just one short week before my birthday. Usually it is almost two weeks before, due to the scheduling of an ACU event that brings us all home. It was nice having that time a little closer to the actual day. I got a fun wind chime from my parents and a copy of Toy Story2 from Heather, Phillip & Emily. I have two very good friends whose birthdays fall in the same week as mine....Sarah's is Feb 25 and Katie's is Feb 27, while mine is Mar 1 (Katie and I were actually born in the same hospital!!) As we were all turning 33 this year, Sarah got creative and came up with a theme centered around the number 3. She did some research and found Theater 3 with a performance the weekend of the celebration and a nearby restaurant had a three-course meal for a reasonable price. So rather than our usual celebration of dinner and a movie, we caught a matinee performance of "Don't Dress for Dinner" and ate at the Dream Cafe next door afterwards. Theater 3 is done in the round and there were only 6 or so rows of seats up on each side (really it was a square, not a round), so there was not a bad seat in the house. All the action is right there in the middle of the floor. It was quite a hilarious show. We walked next door for dinner and decided that the set three-course meal wasn't quite what we wanted, so we made our own.....we shared a black bean-corn relish and cheese fondue for our appetizer and then each selected an entree. I enjoyed their Mystic Pasta - a blend of grilled chicken, brie cheese, caramelized onions and bacon with farfalle pasta in a garlic white wine cream sauce....it was quite yummy. Then began the hunt for an appropriate dessert to top off our evening.....we ended up at Pokey O's for some custom ice cream sandwiches....they were so good. It has been cold and rainy here this week.....I'm glad it felt like winter a bit longer, I was already tired of the 80 degree temps in Feb!! I finally went out to dump my rain gauge this morning.....over 3.5 inches!!! Yay! I hope the rain continues through the summer....my first summer in the house I didn't water my yard at all because it rained so much. Last summer was a wakeup call on lawn care because we had almost no rain. I've also been playing quite a bit the last few days with a new toy.....can you guess what it might be? Yes, I have jumped on the Apple bandwagon just a little bit more.....and switched service providers as well......and now have a fabulous new iPhone. I LOVE IT. I've only had it for 2 days, but already have a ton of apps downloaded, my email and calendar synced and I'm so excited. Get to spend some good time with my Emily this weekend....can't wait! !